She's Fantastic: Avengers Movie Series - Figure 14 BLACK WIDOW! 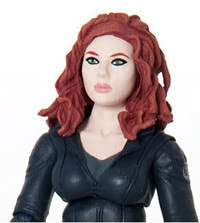 Avengers Movie Series - Figure 14 BLACK WIDOW! I say "finally" because there was a cancelled Black Widow figure solicited for the Iron Man 2 toy line a few years ago. I wanted it desperately because I have always been a fan of Scarlett. Some of these figures made it on to ebay, but I was not one of the fortunate few able to snag one. I was assuming she would be re-released for the Avengers movie, but this final version that finally saw widespread release is a total retooling of the IM2 figure. The Avengers version is great with lots of nice details and a very passable likeness of Scarlett Johansson. The only thing I regret about not getting an IM2 version is the great hair. The new version is fine and very movie-accurate, but I loved her Iron Man 2 hairstyle and it's a shame we won't see it. Hopefully they'll find a way to sneak her onto the shelves eventually. Check out the detail on her boots and the decals on her shoulders and hands. Here are some pics of the original Iron Man 2 Black Widow figure. Click either of pictures below to see a great photo series of this figure from someone lucky enough to snag one of these cancelled figures. Pictures swiped from OnePerCase.net. Visit them! Here is a series of photos comparing the new Avengers figure with the comic-style Marvel Universe figure from 2010. 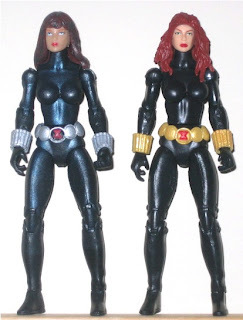 And here is a pic I found online of the Marvel Universe Black Widow with the Avengers Movie figure that came with the "Light-Up" base assortment. 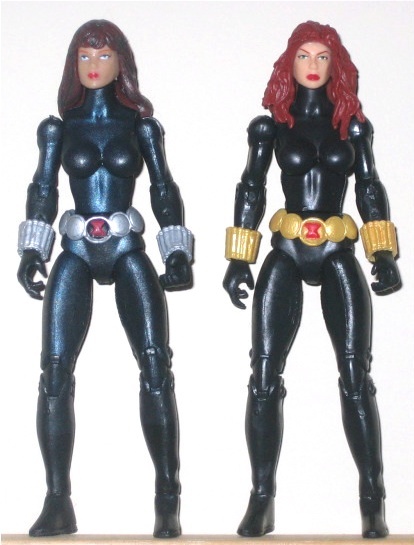 She has Marvel Girl's head and a Black Widow body with Gold accents. From Left to Right: Marvel Legends (GrayVariant), Marvel Universe, Marvel Select, Avengers Movie, Marvel Legends (Black Variant).